PREVIEW: Virginia Opera's "The Magic Flute" | Theater | Style Weekly - Richmond, VA local news, arts, and events. 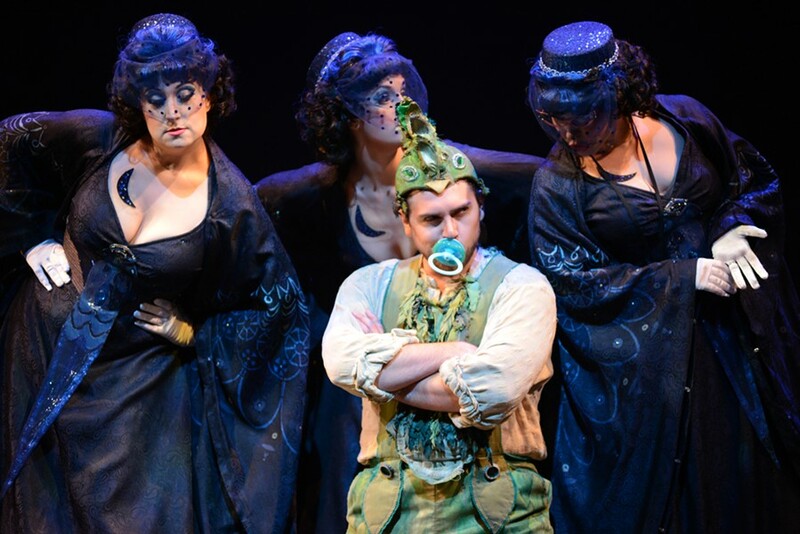 PREVIEW: Virginia Opera's "The Magic Flute"
Papageno (David Pershall) and The Three Ladies shown in Virginia Opera's "The Magic Flute," which will be performed at Richmond Centerstage's Carpenter Theatre this weekend. It’s the opera that got Wolfgang Amadeus Mozart killed. That statement might sound ridiculous, but there is a conspiracy theory which holds that Mozart’s final opera “The Magic Flute” revealed too much about the Freemasons, and resulted in his demise. At least part of the theory is true: Both Mozart and “Flute” librettist Emanuel Schikaneder were Freemasons, and the work makes fun of some practices of the fraternal organization. Similarly intriguing is the opera’s fantastical plot, which follows the handsome prince Tamino and his bird-catching sidekick Papageno as they attempt to free a princess from an evil sorcerer. The Queen of the Night has charged Tamino with rescuing her daughter, but as the plot unfolds, it’s revealed that things aren’t exactly as the Queen led him to believe. Because of the work’s whimsical nature, the opera is often portrayed as a fairy tale, but that interpretation alone didn’t interest Michael Shell, director of Virginia Opera’s production which hits CenterStage this weekend. Instead, Shell is depicting the opera as part of a dream, and begins with a modern-day couple quarreling before going to sleep. As the characters deal with forces of good and evil, the opera drives home the idea that we all have to deal with life’s struggles together; though Shell says the work is more than just a show with a moral. Perhaps no one knows this better than Heather Buck, who has portrayed the Queen of the Night more than 10 times. As the Queen of the Night, Buck has to tackle some of the most difficult arias in opera, though she loves her character. In some ways, Buck says the work is more like a piece of musical theater than an opera because it’s a Singspiel. Literally translated from German, the term means “song-play,” and has breaks in the music for dialogue instead of recitative, a term for sung speech. Shell says this production - which is in English - is trying to get away from the elite image that many people have of the opera. Virginia Opera’s “The Magic Flute” runs Nov. 22 and 24 at Richmond CenterStage’s Carpenter Theatre. For more information, visit vaopera.org or call 1-866-OPERA-VA.